Welcome to Temple Sinai Preschool, a warm, welcoming, creative Jewish environment with a focus on academics through play. The program, accredited by The Georgia Accrediting Commission, offers small classes, an experienced staff, and modern classrooms filled with developmentally appropriate resources. Your child will receive a well-rounded, enriching education that covers a wide array of academic subjects and offers learning opportunities for personal development, values, socialization, and Jewish traditions and customs. 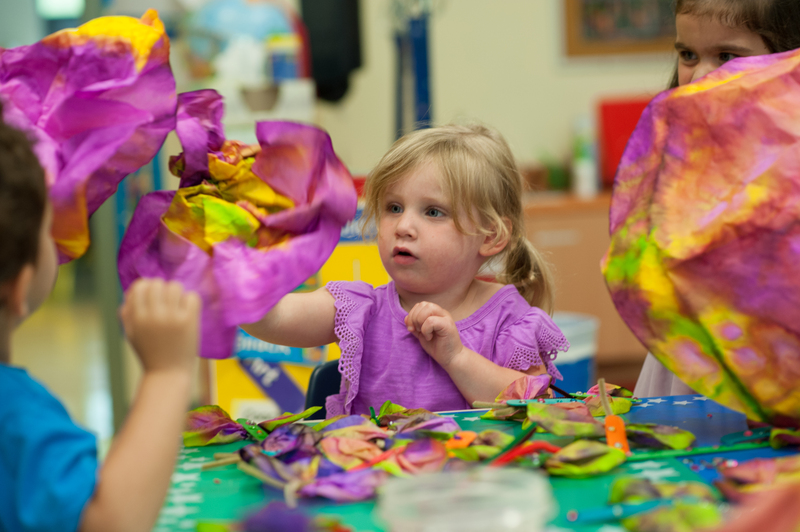 If you are looking for a remarkable and exciting educational experience for you and your child, we invite you to enroll in our preschool and join the Temple Sinai Preschool family. Temple Sinai Preschool is opening a nurturing and engaging infant room in January 2020 in our new, renovated space! Click here to put your name on our interest list. We'll be in touch with you soon with more details. Contact Jamah Maman for more information or to schedule a tour. Our curriculum in every age group is focused on the development of each whole child. Through our belief in “Academics Through Play”, we foster a strong foundation for social, emotional, academic, physical and spiritual growth. These skills form the basis for success in early elementary school and beyond. We are focused on this development by way of learning through play in a warm and welcoming, creative Jewish environment. Temple Sinai Preschool has programs available for children ages 12 months through Transitional Kindergarten. Two, three or five day options are available, depending on the age group. Our core hours are 9:30 am to 1:30 pm with before and after-school enrichment programs available. Learn more here. Join Temple Sinai Preschool for eight weeks of summer camp! Children ages 18 months to Pre-K spend the day participating in fun, engaging activities with weekly special performances and programs. Come for all eight weeks or choose what works for you. Before and after-camp enrichment is available. Learn more here. working to bring TSPS students and families an enriching learning environment. We can’t wait to share it with you! Limited spaces are available per age level, so be sure to secure your spot early! Jewish education is about creating Jewish memories that will last throughout our lives. Jewish memories are formed in educational experiences, in youth group, on trips and social action days, in family programs, with Jewish friends and more. Together, we can form the foundation of creating Jewish memories for our children and for our families. The Gathering of Friends, Tribute Garden bricks continue to be available for purchase to commemorate your family and its legacy at Temple Sinai. Commemorate a lifecycle event, honor your preschool graduate, remember your time at Sinai's Noar Sunday, or honor a loved one.